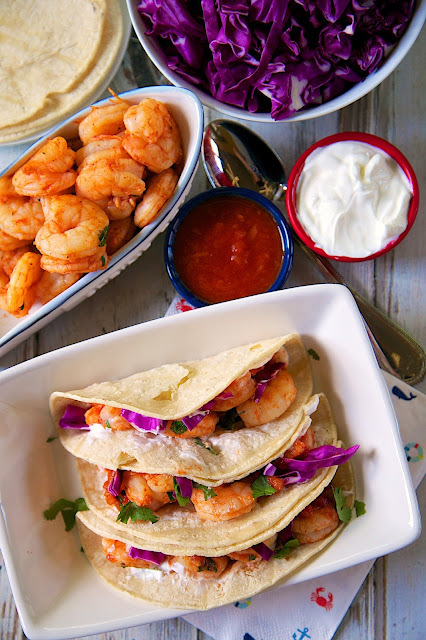 Ceviche-Marinated & Grilled Louisiana Shrimp Tacos Recipe - shrimp marinated in a mixture of tomato juice, lime juice, red onion, cilantro and chili powder. Marinate for 20 minutes and grill for 6 minutes to finish cooking. To assemble the tacos, we grilled a few corn tortillas and topped them with shrimp, sour cream, cabbage and salsa. SO good! Better than any restaurant! If you follow the blog, you already know that we don't have a lot of seafood recipes, but we are working on adding more. We love to grill, so our first recipe in our new seafood series had to be a grilled seafood recipe. I think these Ceviche-Marinated and Grilled Louisiana Shrimp Tacos are a great start! These tacos were SO good and were ready in under 30 minutes! They tasted better than any shrimp tacos we've ever eaten in a restaurant!! Louisiana boasts a network of waterways including two alluvial deltas, rich estuaries, brackish bayous and lakes meeting the Gulf of Mexico. Because of this, Louisiana produces a volume and variety of superior seafood unlike anything found elsewhere. All of these factors make Louisiana Seafood the best in the Gulf! In addition to shrimp, Louisiana Seafood offers oysters, crab, crawfish, fish, and alligator. I've never had alligator, but I hear it tastes like chicken. Maybe I would like it! The shrimp tasted so fresh! You would have sworn you were eating it on the beach! Chicken Legs has already been browsing the Louisiana Seafood site for more recipes! Check them out at www.LouisianaSeafood.com/recipes. We have a fancy new grill basket, so I guess we have no excuses to not grill more seafood. For the Ceviche-Marinated and Grilled Louisiana Shrimp Tacos we marinated the shrimp in a mixture of tomato juice, lime juice, red onion, cilantro and chili powder. We let the shrimp hang out in the fridge for about 20 minutes and then grilled them for about 6 minutes. To assemble the tacos, we grilled a few corn tortillas and topped them with shrimp, sour cream, cabbage and salsa. They were SO good. Seriously delicious! Make them this weekend. You will thank me, I promise. Preheat grill or grill pan to high heat. Mix lime juice, cilantro, tomato juice, onion and chili powder in a bowl. When fully mixed, add in the peeled and deveined Louisiana shrimp, cover and refrigerate for 20 minutes. Remove shrimp from marinade and place them on the hot grill. Cook until the shrimp are done, 4 to 6 minutes. 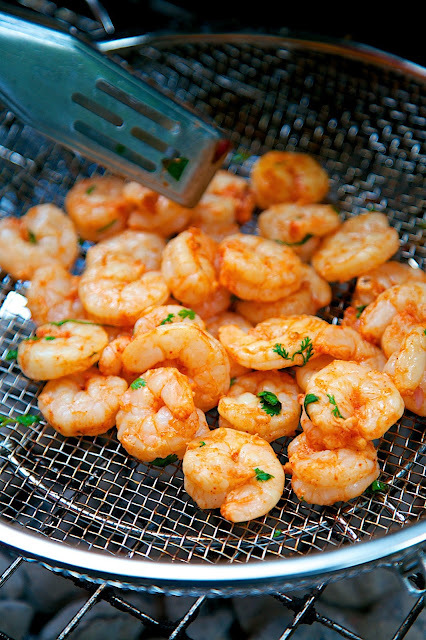 Remove shrimp from the grill and place them aside. Lay the tortillas, a few at a time, over the hot grill until warm, 20 to 30 seconds. Stack on top of each other on a plate. On each tortilla, place 3 shrimp, shredded cabbage, salsa and sour cream. Fold in half. Ruby Tuesday makes a dish I love called New Orleans Seafood. Going out can get super pricey so I found a copycat recipe for it and that is my favorite seafood dish. I love coconut shrimp! And I love your recipes too. Thanks! We created our favorite shrimp in 2005 when South Florida was hit with 2 Hurricanes. After we lost power , our shrimp was the first to defrost. We marinated the shrimp in our favorite Italianarimade, fired up the gas grill and grilled the shrp. "Hurricane Shrimp" was born !!! My favorite seafood recipe is crawfish etouffee ....easy to make! 2. Add the jalapenos, tomatoes, onion, celery, cilantro, olive oil, salt and oregano; mix gently. Serve at once. Or refrigerate at least 30 minutes or up to 4 hours. Transfer ceviche to a platter; garnish with avocado slices. I really enjoy shrimp that is cooked correctly. A nice grilled shrimp is my favorite! My favorite is shrimp scampi. thanks for offering this giveaway. My favorite is a classic lobster roll!!! Yum!!! Toss the lobster meat with the mayonnaise. Chill. Heat skillet and butter the outside of the roll. Place roll in the skillet and grill till lightly golden on each side. Open the roll and place lobster claws on either side, fill the middle with the rest of the lobster. I'm allergic to shellfish and don't like seafood, but my husband loves it. And he loves when I make him oyster stew. I use a small jar of oysters, milk, butter, some seasonings and Worcestershire sauce. So simple and he loves it. My favorite seafood recipe is based on Paula Deen's Creole Shrimp and Lobster Bisque. I use scallops instead of the lobster and broil them along with the shrimp. It's really a simple dish to make, but oh soooooo good. I love almost all seafood but there is nothing like soft shell crabs! They are only available for a short time during the summer, (and the summer season flies by here in NY state) so enjoying soft shell crabs means SUMMER!!! My fav. seafood recipe is Seafood Pasta. I found this recipe and first made it over 30 years ago. The whole fx loves it: scallops, shrimp, and whatever else you want in in a parmesan sauce. 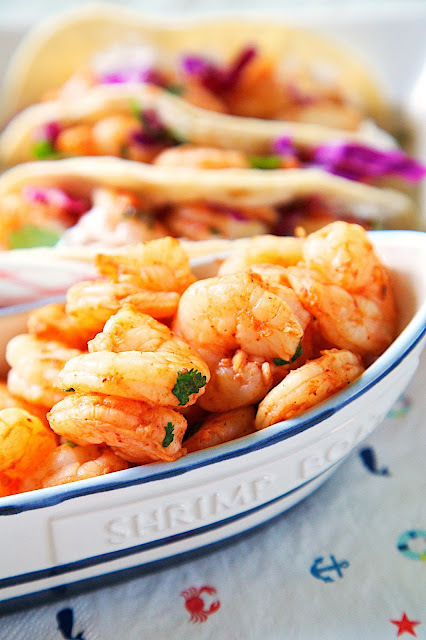 I love shrimp in any form- from grilled to sautéed to fried to scampi to tacos, there's no bad way (that I've found anyway) to have shrimp! mahi mahi with a crawfish sauce on top. I get this at a restaurant in Houston TX called Pappasito's. And boy I wish I had the recipe. When I go back home in November it's on my must have list. I love shrimp! Shrimp scampi & shrimp Alfredo are awesome! I really wish I had a grill to try this cause it looks really yummy! My favorite shrimp recipe is by far Shrimp & Grits! I could eat Shrimp & Grits any time! I could totally go all Forest Gump on you and list all the ways I love shrimp, but my favorite recipe would have to be Nathalie Dupree's Hot and Spicy Shrimp. You can tell how much I've made it over the years by the amount of garlic butter splashed on that page of my cookbook. A sign of true love! You can add sides, but all you'll care about is digging into those shrimp, then sopping up every last drop of the garlic butter with some good bread. I found the recipe on line here: http://www.recipegoldmine.com/fishsea/hot-spicy-shrimp.html, its also in her New Southern Cooking book. I love a shrimp boil with sausage, potatoes, and corn on the cob. I love a classic grilled salmon. Yay for a giveaway! I love crab legs, especially when I am at the beach! Hard to pick just one. Soft shell crabs are a favorite, lobster rolls are definitely up there, blackened shrimp alfredo is up there too. Grilled shrimp tacos are my favorite. I love shrimp just about any way it can be served but also love scallops, salmon, etc. Only seafood I am not crazy about is oysters but every once in a while I'll give them a try. I love angel hair shrimp pasta! I love just about any recipe that has crawfish. I don't eat seafood but my husband like scallops! They make them at his work so I don't have a good recipe, but I'd love for a chance to be entered! I love mahi mahi with red potatoes and asparagus. Swordfish is really good too! I love shrimp and cheddar grits, yum! Baked salmon with wasabi mayo smeared on top. Crab boil on the beach with friends. I'm allergic to seafood, but I loved she crab soup. I love shrimp, crab and andouille sausage with bowtie pasta and alfredo sauce. Shrimp pasta with feta! Yum! I love my homemade Crab Cakes that I make all the time! Tuna poke is my favorite! I am weird, I am from New Orleans and don't like shrimp! Simple pan-fried scallops and crab cakes are my absolute favorite, but I love almost any kind of seafood. I love making shrimp po boys with remoulade sauce. My favorite is this homemade Seafood Medley Jambalaya my mom makes, always a yummy dish! I love making crab and lobster stuffed mushrooms. I like to slather some honey mustard on salmon and then bake it. It's great! Add a tossed salad and you're good to go! My mom always makes ceviche, but my fave is her shrimp and linguine mix!! I also love her chupe de camarones. Delish!! I love shrimp scampi, but after a good day of fishing in West Tennessee, we love to fry or grill fresh brim, crappie, or catfish! I love Shrimp Gumbo! Thank you for the wonderful giveaway. Crawfish étouffée. In fact reading this post makes me want some! I adore Maryland Crab Soup: stewed tomatoes, lima beans, corn kernels, old bay, crabmeat, carrots, beef broth. It's so yummy! I luv,luv,luv Shrimp de Jonghe...I make it at home when shrimp is on sale and usually make a loaf of crusty french bread to go with it. I t is my Hubbys favorite meal too and we always have it as often as possible! I love all kinds of seafood. Tuna is probably my favorite! I actually enjoy good old fish and chips the most! My favorite seafood is grilled shrimp. I love fried fish with lemon! I love some shrimp gumbo with sausage and some hot peppers! I love wood grilled salmon with a lemon sauce. I love to eat just shrimp, boiled, with shrimp sauce. My all-time favorite seafood recipe is definitely garlic butter shrimp like you get at food trucks on Oahu's North Shore. It's amazing! My favorite is grilled lobster with garlic-parsley butter. My favorite seafood recipe is shrimp fried rice. Easy and delicious. Shrimp fried rice is my current favorite seafood dish. So good, and simple, too. My wife and I both love crab dip, we use up the leftovers from a dinner to make it for lunch! I posted a tweet: https://twitter.com/FireRunner2379/status/612297699996618752. Coconut shrimp is pretty amazing. I love lobster mac and cheese. I really like fish tacos. I love garlic shrimp like the trucks in hawaii offer. My favorite seafood dish is one we get at our local tapas restaurant. Langosta frita - basically lightly fried chunks of lobster tail served with a garlicky, herby sauce. It's wonderful! I love caribbean fish. Basically any type of fish with jerk seasoning on a bed of coconut rice and black beans. I don't eat much seafood, but I want to try the Blue Crab Louisiana Gratin. I like anything with shrimp in it. I love coconut shrimp. Thanks so much. Cajun seafood pasta is my all time favorite! Delish !! I like shrimp cocktail in a Marie Rose sauce. I love to eat Jumbo Lump Crab Cakes. sockeye salmon in a special napa valley sauce! 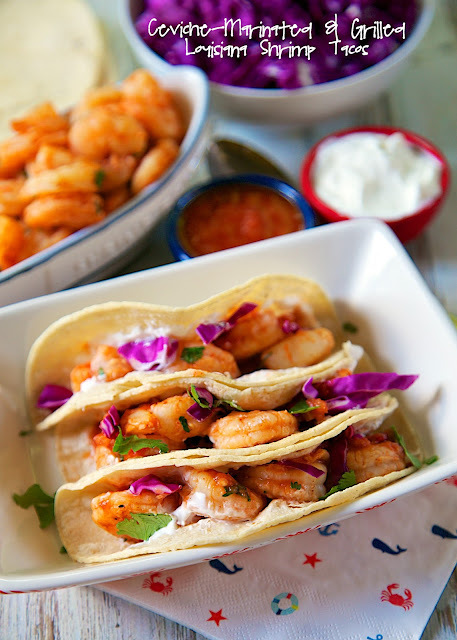 Ceviche-Marinated and Grilled Louisiana Shrimp Tacos, I have tried these and so good. I love cooking shrimp in lot's of butter, garlic salt and eating it with Bar Be que dressing. I like Lemon Garlic Shrimp with pasta. I'm a vegetarian, but I'll have to admit that looks good! I'll share the link to your recipe with family and friends. My favorite is grilled cajun shrimp. My favorite seafood recipe (that I make) is crab quiche. I'd like to make their gumbo with okra recipe. We are big fans of a good seafood gumbo! I love shrimp scampie and shrimp alfredo. I love shrimp grilled on the barbie, then sprinkled with salt and pepper and lemon juice. I love lobster w/ butter. My favorite is lobster roll without mayo.. I love spicy shrimp on the grill. I make a real simple shrimp boil that's delish! We don't really have any other than shrimp alfredo. Thank you!! My favorite is shrimp scampi. I love shrimp fried rice. My favorite seafood recipe is Maryland Crab Dip; but from their recipes, I'd love to try the crab imperial. I love sea bream ceviche with fresh coriander ; with extra fresh fish, it's just incredibly good ! I heart seared ahi tuna. I really like coconut shrimp. Not really a recipe but I like making steamers. Easy and delicious.